Author Don Harrison with his new book. 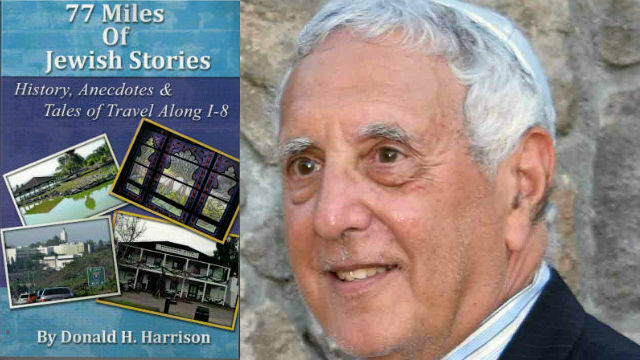 If you go to the website of the San Diego Jewish World, you will see its motto, “There Is a Jewish Story Everywhere!” Owner and publisher, Don Harrison, delights in traveling, meeting people, and sniffing out that Jewish story. You can read about his latest adventures in his third book, “77 Miles of Jewish Stories.” These stories take place along the 77 miles of Interstate 8 in San Diego County, from Ocean Beach to the far end of East County, finishing at the Imperial County line. Harrison decided to see if he could find a Jewish story in the vicinity of every exit off the highway. You would be surprised at the wide array of stories he found! What is nice about this book is that you can go to the table of contents — there are 70 short chapters — and quickly find a story or area that interests you. Then, when you have time to really savor it, read the book from cover to cover and discover many fascinating people and facts along the way. One of my favorite chapters is about the Roseville section of Point Loma and its namesake Louis Rose, a visionary entrepreneur who realized the potential of buying land between Old Town and the San Diego Bay. You can find a plaque honoring him near the water at Liberty Station. You can also see Rose’s influence in Old Town. The visitor information center at the State Historic Park is located in the Robinson/Rose house, named after Rose and attorney James W. Robinson. I also enjoyed the chapter on Rabbi Wayne Dosick and his “all-faith service” at the Catholic University of San Diego, and the chapter on the Jewish connection to Mission San Diego. As you travel east, there are chapters on the Weinrib family and their Eddy Pump company, Catherine Hand’s Dream Rider Equestrian Therapy in Alpine, the Camp Lockett Buffalo Soldiers of Campo, alpacas in Descanso, and finally, the Desert View Tower in Jacumba Hot Springs. There is a funny chapter on Lake Murray and how some of the nearby congregations go there during Rosh Hashanah. As an act of atonement, they cast bread into the water to atone for sins and ask for a fresh start. The funny part is the description of the bread that goes with the sin. For example, white bread is for ordinary sins while rye bread is for particularly dark sins. This is a book that many San Diegans — Jewish or not — can enjoy while learning about the rich history of the area they live in.